National Psoriasis Foundation. 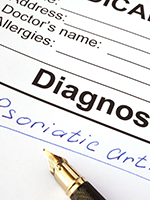 Psoriasis and comorbid conditions issue brief. www.psoriasis.org/sites/default/files/advocacy/PsoriasisandComorbidConditionsIssueBriefonepager20140225.pdf. Accessed May 23, 2017. Mayo Clinic staff. Diseases and conditions: psoriasis. May 12, 2017. www.mayoclinic.org/diseases-conditions/psoriasis/home/ovc-20317577. Accessed May 22, 2017. Kurd SK, Troxel AB, Crits-Christoph P, Gelfand JM. The risk of depression, anxiety, and suicidality in patients with psoriasis: a population-based cohort study. Arch Dermatol. 2010;146:891-895. Papp KA, Reich K, Paul C, et al. A prospective phase III, randomized, double-blind, placebo-controlled study of brodalumab in patients with moderate-to-severe plaque psoriasis. Br J Dermatol. 2016;175:273-286. Fitch E, Harper E, Skorcheva I, et al. Pathophysiology of psoriasis: recent advances on IL-23 and Th17 cytokines. Curr Rheumatol Rep. 2007;9:461-467. Cosentyx (secukinumab) injection [prescribing information]. East Hanover, NJ: Novartis; January 2016. Taltz (ixekizumab) injection [prescribing information]. Indianapolis, IN: Eli Lilly; January 2017. Siliq (brodalumab) injection [prescribing information]. Bridgewater, NJ: Valeant Pharmaceuticals North America; February 2017. US Food and Drug Administration. FDA approves new psoriasis drug. Press release. February 15, 2017. www.fda.gov/newsevents/newsroom/pressannouncements/ucm541981.htm. Accessed May 18, 2017. Siliq REMS Program. Siliq certified pharmacy network. June 15, 2017. https://siliqrems.com/SiliqUI/certificationLookup.u. Accessed September 8, 2017. Stelara (ustekinumab) injection [prescribing information]. Horsham, PA: Janssen Biotech; September 2016.